Last week, I wrote about a class discussion my students had on A Wrinkle in Time. Each time I read this Newbery winner, I reflect on what makes it such an enduring classic. How can a fifty year-old science fiction novel, written before anyone even landed on the moon, still grab young readers? What, if anything, can aspiring writers learn from it? First, I think it is that rare combination of being both character driven and plot driven. It is character driven in that we see Meg, a character we care about, grow and change over time. It is plot driven in that there is plenty of action to engage young readers, but beyond the action plot, there is the emotional plot as well. Young adults can empathize with the emotions Meg experiences; the desire to fit in vs. the dangers of conformity, the battle of good vs. evil, and the triumph of love. Still, chapter 11 always feel like it drags, to me. And could anyone today get a novel published with the first line, "It was a dark and stormy night?" 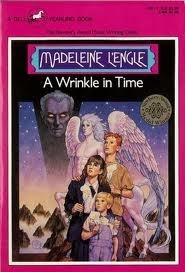 I read that Madeleine L"Engle received 26 rejections before someone offered to publish this book. I'd love to see the editors' comments in those rejection letters! I'd love to know what agents and editors today would say if they received this manuscript.